A lot of the gym rats I know have a running joke about this. It goes something like “the hardest day of the year to get an open treadmill is January 2nd, the easiest is February 2nd”. It loses something in the translation. It’s a much better line standing out in the cold with a dishwater tasting cup of McDonald’s coffee at 4:52 AM waiting for the YMCA to open. Anyway, the idea is why make’em if you know you are going to break’em (I gotta send that to Jessie Jackson). It’s a strange cycle to get sucked into. The old “I’ll have a piece of cheesecake tonight, but then I won’t eat for the next week” thing. I get into that a lot. New Years is a celebration of this sort of odd but compelling form thinking. I like the way you use the duality ego vs. reality framework to make this case. I’ve never really thought of that aspect of it, but it makes a good deal of sense when you think about it that way. 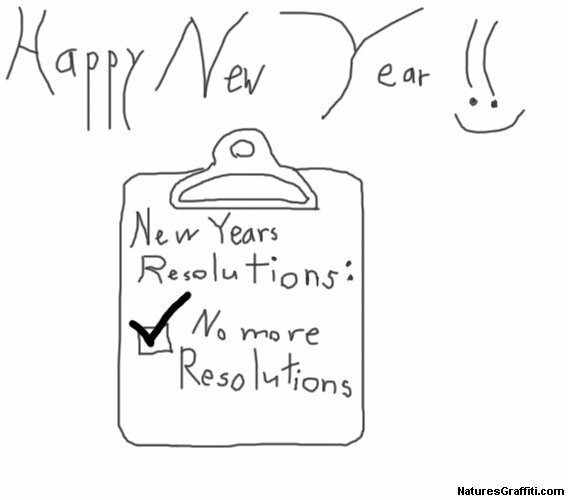 I’m planning on never making a New Years resolution again. I think I am going to start next year though. Yeah, I guess the cyclical nature of life is the culprit here. The constant experience of new beginnings with Jan 1st being the most celebrated. I guess it’s just in our DNA….